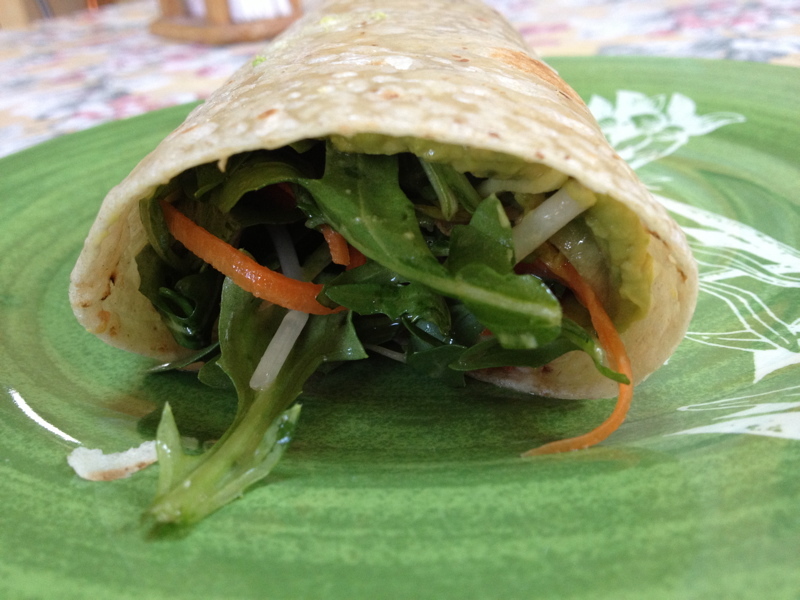 I love love love the tortilla wrap sandwich and recently I found a great gluten free wrap made of brown rice. So, needless to say I'll be wrapping everything and anything this summer. This was one I made on a whim just because I wasn't in the mood for meat. You can basically use any veggie you have on hand, it's all good. Yeah, it's hard to take a good picture of a wrap sandwich but you get the idea. I'm in love with my julien peeler and if you had one, you would be too. I just think julienned slices are more manageable for a wrap but if you don't have one, use your skills and slice the cucs pretty thin. I would suggest matchstick style for the carrot. Once your cuc is sliced put it in a colander with some kosher salt and let it drain while you chop and gather the rest of the ingredients. Mix cucumber, carrots, arugula, tomatoes, bean sprouts in a large bowl with some olive oil, vinegar and salt and pepper. Smash the avocado in a small bowl, add a dash of salt and pepper and chopped cilantro. Cover the wraps with a moist paper towel and warm them in the microwave for about 30 seconds. Spread the avocado on the wrap like sauce on a pizza. Edge to edge. Then place your veggie salad in the middle. Use a good 2-3 handfuls, roll half way, tuck one end, roll over. The end tuck may be a bit tricky since the tort is a little less plyable than traditional flour torts. Don't stress it's all good. There, quick summer salad warp. Enjoy.